This Demonstration obtains estimates of the maximal Lyapunov exponent for four chaotic datasets (each of length 4000). The data is derived from the logistic, Hénon and Lorenz models and NMR laser data. 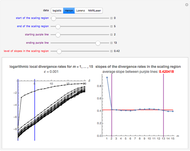 The figure on the left displays logarithmic divergence rates for some embedding dimensions (as functions of a time distance ). They are calculated at discrete points, which are joined with lines. 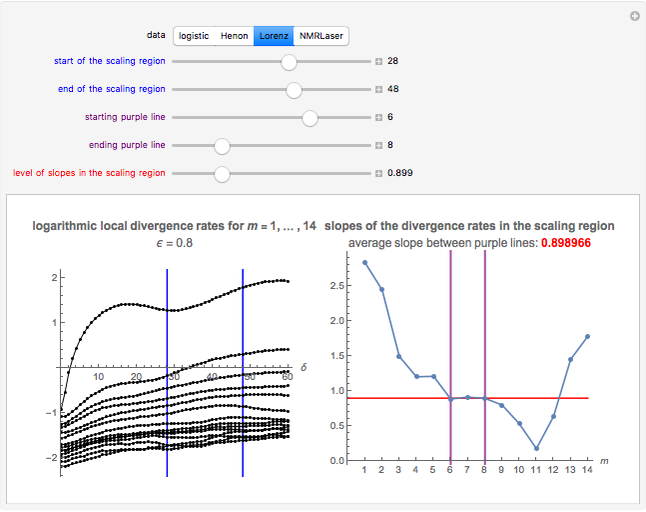 The logarithmic divergence rates, which require significant computation times, were calculated outside of this Demonstration (for these computations, see "Analysis of Chaotic Data with Mathematica" in the Related Links). 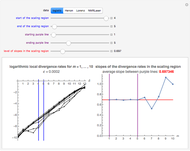 We first search for a so-called scaling region where the divergence rates develop approximately linearly with very similar slopes for several values of . This is represented by the two blue vertical lines. 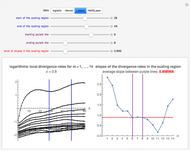 A linear fit for the divergence rates between the vertical lines (endpoints included) is then computed for each . The slopes of these lines are shown in the right-hand plot for each value of . If, for some scaling region, we get slopes that are approximately constant for several values of , this constant is an estimate of the maximal Lyapunov exponent. We denote the region of these slopes with the two purple vertical lines. The figure then shows the average slope between these lines (endpoints included); this average is an estimate of the maximal Lyapunov exponent. The red line can be used to check the constancy of the selected slopes. The first figure also shows the interval between neighboring data points. Snapshot 1: Logistic data. The figure on the left shows a narrow scaling region between and . The slopes of the linear fits for the points between the two blue lines are given in the figure on the right. There, we can see that the slope is approximately 0.697 when the embedding dimension has values from 1 to 5. The value 0.697 is our estimate of the maximal Lyapunov exponent. The actual value of the maximal Lyapunov exponent for the logistic model is [1, p. 417]. Our estimate is close to the actual value. Snapshot 2: Hénon data. A scaling region seems to be between and . The slopes of linear fits of these points are approximately 0.420 for . The value 0.420 is the estimate of the maximal Lyapunov exponent. The actual value of the maximal Lyapunov exponent for the Hénon model is 0.41922 [1, p. 421]. Our estimate of 0.420 is close to the actual value. Snapshot 3: Lorenz data. A scaling region seems to be between and . The slopes of linear fits of these points are approximately 0.899 for . The value 0.899 is the estimate of the maximal Lyapunov exponent. The maximal Lyapunov exponent of the original continuous Lorenz system is 0.9056 [1, p. 431]. Our estimate of 0.899 based on the sampled Lorenz system is close to the actual value. Snapshot 4: NMR laser data. A scaling region seems to be between and . The slopes of linear fits of these points are approximately 0.276 for . The value 0.276 is the estimate of the maximal Lyapunov exponent. These four settings are set as bookmarks in the "Bookmarks/Autorun" menu. The maximal Lyapunov exponent is a characteristic of the dynamical system and quantifies the magnitude of chaos. Indeed, in chaotic systems, nearby trajectories diverge exponentially fast. The properly averaged exponent of this divergence is the maximal Lyapunov exponent. It describes the average rate at which predictability of the system is lost. A typical computing time is from a few seconds to half a minute. We used the same four datasets (each containing 4000 values) as in "Chaotic Data: Delay Time and Embedding Dimension"; see Related Links. For each dataset, we also used here the value of the delay time that we obtained in that Demonstration (these delay times are 1, 1, 16 and 1 for the four datasets, respectively). 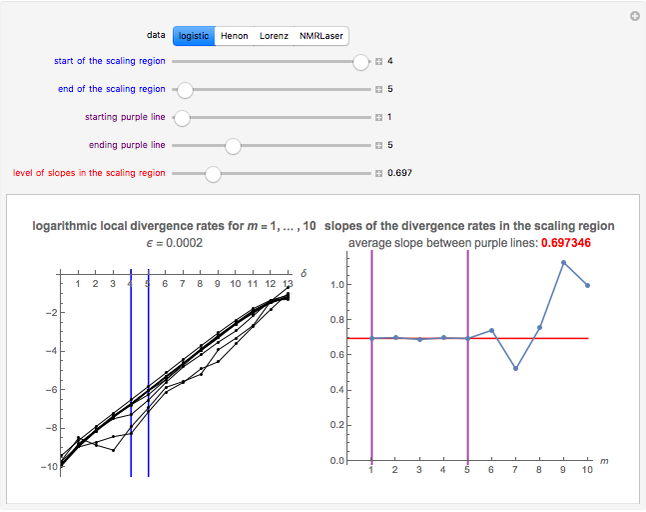 For details and other references, see "Analysis of Chaotic Data with Mathematica" in the Related Links. 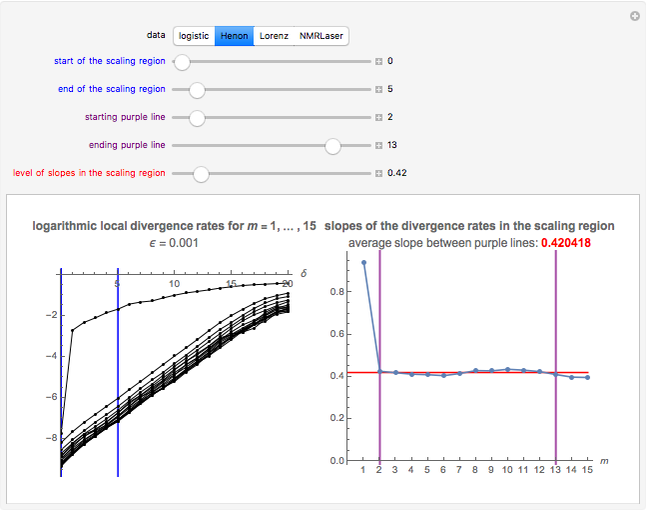 In that work, we estimate the delay time, embedding dimension and correlation dimension, and also consider prediction. In the Demonstration Chaotic Data: Delay Time and Embedding Dimension, we estimate the delay time and embedding dimension for the same four datasets. In the Demonstration Chaotic Data: Correlation Dimension, we estimate the correlation dimension. J. C. Sprott, Chaos and Time-Series Analysis, Oxford, UK: Oxford University Press, 2003. Heikki Ruskeepää "Chaotic Data: Maximal Lyapunov Exponent"